There are few things more romantic than the beach during winter. It’s secluded, the ocean is just as beautiful and it’s perfect for a Valentine’s Weekend romantic getaway. Captain's Quarters Resort in Myrtle Beach is the perfect choice for your oceanfront getaway to celebrate your love. Combine oceanfront Myrtle Beach accommodations with exceptional amenities and a romance package for the most unforgettable Valentine’s Weekend ever. The items will be in your room when you arrive, making for the perfect start to your Myrtle Beach Valentine’s getaway! Give us a call to add a package to your existing reservation or add it when making your new reservation with us! Cuddling up together and watching the sun rise on your oceanfront balcony is the best way to start your Valentine’s Day. You may even be lucky enough to see dolphins frolicking in the water or pelicans swooping over the ocean. Make a cup of coffee with the in-room coffee maker and step outside for the best view. Here, at Captain’s Quarters Resort, we have a variety of oceanfront accommodations to choose from! The Oceanfront King Room is a popular oceanfront option which features floor-to-ceiling windows, the Oceanfront King Suite offers more space including a kitchen, and the Oceanfront King Studio offers a cozy oceanfront experience. 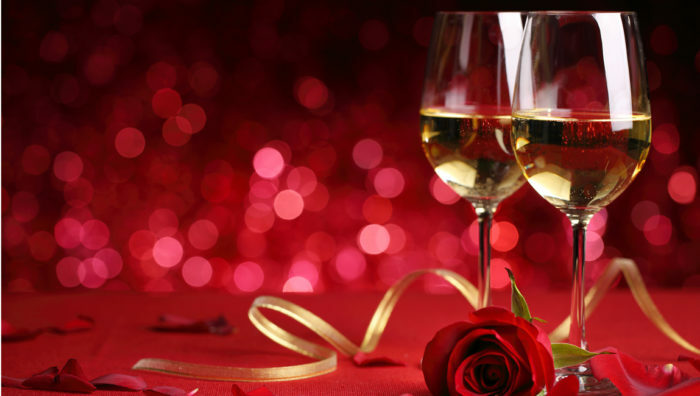 Choosing a resort with fantastic amenities for your Valentine’s Weekend getaway in Myrtle Beach is important! Here at Captain’s Quarters, we have all you need for the perfect weekend. Our three bubbly indoor hot tubs, indoor lazy river and our oceanfront outdoor hot tub provide the best relaxation. During the evening, head up to our Level 6 Entertainment Center where you can get a cocktail and enjoy a friendly game of bowling with your significant other. With easy beach access, you can also enjoy a relaxing walk, hand-in-hand, on the beach as the sun sets behind the cityscape of Myrtle Beach or have a picnic as the waves crash ashore. Is there any better way to end your romantic day than that? Or, you can just spend your weekend relaxing beachside with your loved one under the starry sky! Myrtle Beach and Captain’s Quarters Resort are the perfect choice for your romantic Valentine’s Weekend escape. Start a new tradition and plan your romantic getaway today!